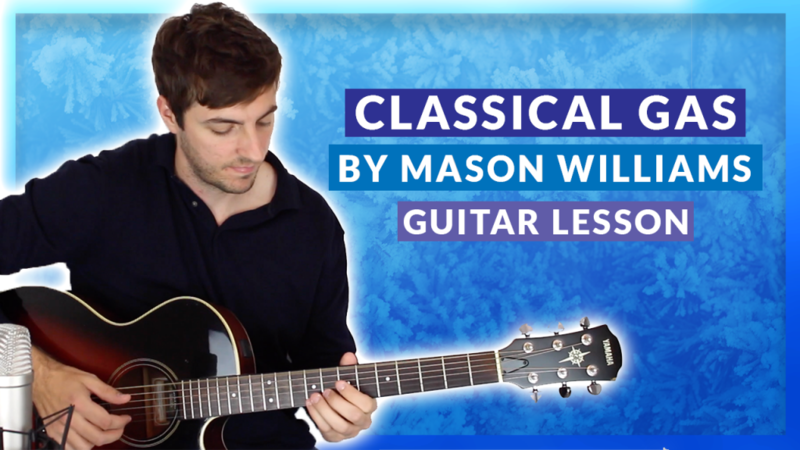 In this lesson we're going to be learning how to play one of the most famous guitar instrumentals ever recorded - Classical Gas by Mason Williams. Released in 1968, this 3 minute action-packed song holds nothing back, you barely have a second to breathe when playing it. Classical Gas has been covered by some of the greatest musicians on earth. Artists such as Tommy Emmanuel, Steve Howe, Eric Clapton and many others have had a stab it, continuing to keep the song popular amongst blossoming fingerpickers. Classical Gas is no. 55 on my Top 60 Fingerpicking Songs of ALL TIME list. If you've not seen the list be sure to check it out and sign up to my weekly email lesson. That way you won't miss learning any of these great fingerstyle songs. There's no doubt that it's not an easy song to play. Two problems many guitarists encounter when learning this is 1. the speed of it and, 2. remembering the structure. In this lesson I've broken each section of the song up into individual parts in order to help you learn faster, make sure you practise each section in isolation before bringing them all together when you're ready. To help yourself out with gaining the speed, be sure to always a have a metronome at hand to track your progress. First off, here's a run through the whole song from start to finish. The intro to Classical Gas is played freely with no set pulse. It's the easiest part of the song, but regardless of that make sure you really work on your feel as you play through it. This is where all the craziness begins and the tempo picks up. Not necessarily super hard to play, but a lot to remember and playing it at full speed is likely going to be the most challenging aspect. I'd say the chorus is probably more complicated and demanding than the verse. Rhythmically it's hard and you'll need a lot of left hand strength to get each of the notes to ring out. Without a doubt this my favourite part of Classical Gas to play. Again, rhythmically it's tricky, so you absolutely must be practising with a metronome. Much of the ending has been covered earlier in the song, so hopefully adding this section in isn't too much of a struggle for you. Neon (John Mayer), God Only Knows (The Beach Boys), Never Going back Again (Fleetwood Mac), Don't Fear The Reaper (Blue Oyster Cult, Papa George (Tommy Emmanuel. On the strength of you EXCELLENT tutorial of “Classical Gas”, I will purchase the $99 course when I can set aside that amount (retired on social security). I’d like to thank you for the free tutorial. These old fingers have some work to do. I can Hana (Flower) by Massaki Kishibe, so perhaps this may just be a next level jump! Thanks Eddie, really glad that you like the lessons. Keep on practising! Awesome lesson, great vids with playing/description at the right speed; clear sheet music. I just wish I was at home to get practising and not stuck at work!! Thanks a lot. Yeah, guitar is way more fun than work. Hey Dave, thanks for your comment. I’m really pleased to hear that you like my lessons, means a lot to me. I hope I can continue to help you get better at fingerstyle for a long time.